Description: Holly Gotham, Batman! 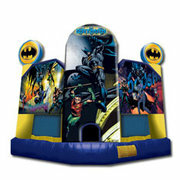 Come jump in Batman's Bat Cave. This classic action hero excites kids and adults alike. Provides hours of fun and excitement for kids. Don't forget kids to bring your Jokers friend and have a "POW", "BANG" blast.